Natural Import Company - Traditional Japanese foods - Mitoku Dried Bonito Large Flakes - 1.76 oz. 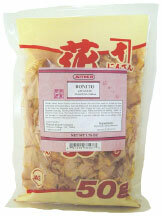 Mitoku Dried Bonito Large Flakes - 1.76 oz. Ingredients: Japanese "Hana-Katuo" dried bonito - Large flakes. Tantalizing fragrances from a steaming bowl of miso soup, full-bodied flavors in a simmered dish. The delightful aroma and taste of Japanese cuisine make every meal a pleasure. What's the secret? Japanese "Katsuo-bushi" or dried bonito fish flakes. They use it to make stock for miso soup or stew, sauce for tempura or noodle dips, and more. Every spring, bonito fish migrate north and remain off the coast of Japan until fall. When they arrive off Japan, it is said that early summer has arrived too. The bonito are boiled whole and cut into halves. The bones and skin are removed, and the good parts are smoked, dried in the sun, smoked, and dried again, time after time. This curing process continues for about six months, finally yielding hard blocks of katsuo-bushi. The brown powdery mold on the surface adds to the curing process.The Blocks of Skipjack Tuna are then shaved into convenient flakes. Bonito flakes can be boiled to make stock, or sprinkled on food. The fish gives the stock a delicate flavor, and adds to the unique taste of Japanese cuisine. Japanese Cooks insist on the taste and fragrance that only katsuo-bushi can give. Chikaishi Kazuhiko, the head chef at a prestigious Japanese restaurant called Aoyagi, puts it this way: "Dried bonito is the heart and soul of Japanese cuisine." It's difficult to imagine Japanese food without katsuo-bushi. Flakes of bonito add something special to meals every day, all over Japan.